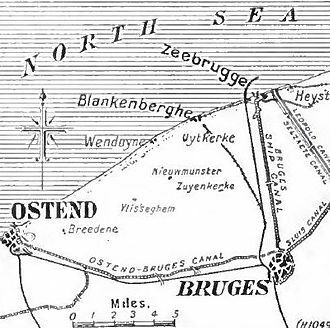 The British raid on Zeebrugge and Ostend on 23 April 1918 was intended to block the entrances to the canals linking the German destroyer and U-boat base at Bruges to the sea. The failure at Ostend led Vice Admiral Roger Keyes, commander of the Dover Patrol, to plan another attack on Ostend. He planned to use the old cruiser HMS Vindictive, which had carried assault marines and sailors to Zeebrugge, as a blockship. She was captained by Commander Alfred E. Godal, who had captained the blockship HMS Brilliant during the previous attempt to block Ostend. She was ready to go on 27 April, but the weather was too bad to proceed. The night was dark enough in the first fortnight of May from 9:30 pm to 3:00 am. The attacking force would take two and a half hours to sail from Dunkirk to Ostend and would have to withdraw by 2:00 am in order to be clear of shore batteries by daybreak. It was decided, with advice from captains of Dover to Ostend steam packets, that the tides would be ideal on 10-13 May and almost so on 9 May. 14 May was a possible date but more doubtful. The delay allowed another old cruiser, HMS Sappho, to also be used as a blockship. The two blockships were accompanied by 18 motor launches and 10 coastal motor boats (CMBs, an early form of MTB/PT Boat). Fire support would come from seven monitors escorted by eight destroyers, five of them French, two motor launches and two French motor boats. The Allies did not know if the German destroyers of the Flanders Flotilla, which had returned to Germany in mid February, had returned to Zeebrugge, so another 12 British destroyers were deployed in three groups of 4 to cover against a German attack on the raiding force. Keyes commanded the northern group from HMS Warwick but Commodore Hubert Lynes commanded the expedition, known as Operation V.S., from HMS Faulknor. On the afternoon of 9 May Keyes and Lynes were lunch guests of the King of the Belgians at La Panne [De Panne in Flemish] in the unoccupied part of Belgium. Keyes noticed a change in the wind so left early, giving the king a hint why. He and Lynes hurried to Dunkirk to start Operation V.S.. Aerial reconnaissance revealed that the Germans had removed all the buoys in the approaches to Ostend. The British had allowed for this and HMS Faulknor carried an illuminated buoy to be positioned at the point where the attacking ships had to turn. To obtain surprise, the main bombardment from shore based guns, naval monitors and Handley-Page bombers would not start until the last moment. Vindictive and Sappho arrived at Dunkirk at 10:45 pm. The expedition sailed 45 minutes later but a boiler problem forced Sappho to drop out just before midnight. Lynes decided to go ahead with only Vindictive since she had been the only blockship available when V.S. was first planned. Faulknor dropped her buoy at 01:25 am on 10 May, with Vindictive passing it 12 minutes later. The British ships were covered by a smoke screen, and the only sign of enemy action until then was a single searchlight. At 01:43 am the British bombardment began. Five minutes later a mist descended, reducing visibility to a few yards and dividing the attacking force into a number of small, uncoordinated units. Vindictive was then about 12 minutes from her target. The destroyers outside the harbour and mist started firing star shells in order to illuminate the canal mouth. CMB 24 (Lieutenant A. Dayrell-Reed) and CMB 30 (Lieutenant A. L. Poland) fired torpedoes at the eastern pier head, damaging it. However, it is doubtful whether these brave attacks succeeded in reducing the German fire. Vindictive was finding it difficult to find the harbour mouth because of the mist. Godsal turned his ship in the hope of finding it. CMB 26 (Lieutenant C. F. B. Bowlby) did manage to identify the eastern pier head and fire a torpedo at it, but it hit the bottom and exploded so close to CMB 26 that she was badly damaged. Godsal was forced to order CMB 23 (Lieutenant the Hon. C. E. R. Spencer) to light a powerful flare in order to illuminate the harbour mouth. This showed Godsal the target but also showed his ship to the Germans. CMB 25 (Lieutenant R. H. MacBean) fired two torpedoes at the pier heads, which hit them but did not stop the fire that was raining down on Vindictive. Vindictive had to steer a course towards the western bank and then manoeuvre across the channel with the help of the east flowing tide in order to block the channel. As she began this manoeuvre, Godsal stepped out of the conning tower for a better view. A shell then hit it, killing him and knocking the navigator, Lieutenant Sir John Alleyne, unconscious. Vindictive remained on her existing course and had run aground by the time that Lieutenant Victor Crutchley was able to take command. He tried unsuccessfully to move Vindictive before ordering her crew to abandon ship and setting the sinking charges. She was lying at an oblique angle and did not block the channel. The survivors of Vindictive were picked up by motor launches 254 (Lieutenant Commander Geoffrey Drummond), which took off two officers and 38 men and 276 (Lieutenant Rowland Bourke), which rescued Alleyne and two ratings from the water. Both launches were badly damaged, and Crutchley had to take command of 254 after Drummond was wounded and Lieutenant Gordon Ross killed. Three men were found alive on board Vindictive by the Germans, despite Crutchley searching her before leaving. Odsal, another officer and a petty officer were amongst the 16 British sailors killed in Operation V.S. : all are listed on Naval-History.net. Shortly after Crutchley informed Keyes onboard HMS Warwick that the mission had failed she struck a mine. The enemy destroyers were absent and the mist was now protecting the British from German shore batteries. She was towed back to port. Keyes wanted to make a third attempt, which was in initially approved. By the end of May, however, the situation had changed with the result that the potential benefits would not justify the risks involved. The Dover Straits Barrage meant that U-boats could no longer travel through the English Channel to the Atlantic, reducing the effectiveness of boats based in Flanders. The Flanders torpedo boats and destroyers were by this stage of the war restricted to a defensive role. On 14-15 February 1918 German destroyers had sailed directly from the Helgoland Bight attack to successfully attack the Dover Barrage. 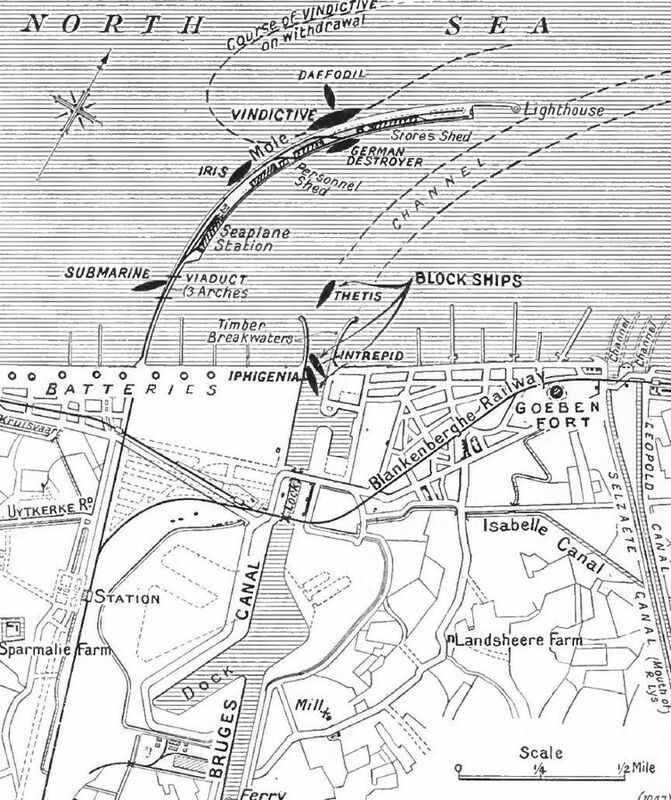 This operation showed that destroyers did not need to be based in Flanders to threaten the Dover Barrage, but it was never repeated. Crutchley, Drummond and Bourke were all awarded the Victoria Cross and a large number of other men were also decorated. See Naval-History.net for the VC citations and a list of the other men awarded medals. B. Pitt, Zeebrugge: Eleven VCs before Breakfast (London: Cassell Military, 2003), pp. 177-80. J. S. Corbett, H. Newbolt, Naval Operations, 5 vols (London: HMSO, 1938). vol. v, p. 266-67. Ibid. pp. 267-69, footnote 1 on pp. 268-69. Corbett, Newbolt, Naval, vol. v, p. 270. Ibid. footnote 2, p. 272. M. D. Karau, The Naval Flank of the Western Front: The German Marinekorps Flandern, 1914-1918 (Barnsley: Seaforth, 2003), pp. 207-8. In February 1916 Germany announced that from 1 March its U-boats would sink defensively armed British merchant ships without warning. Germany had, under pressure from the USA, abandoned unrestricted submarine warfare in September 1915. The Germans claimed that British defensively armed merchantmen had been ordered to attack U-boats before being attacked themselves, so could not be regarded as acting defensively. The Admiralty quickly disproved this accusation by publishing the actual orders. The German position on the issue of unrestricted submarine warfare is described by Paul Halpern as being ‘somewhat confusing’. The naval and military commanders wanted to pursue unrestricted submarine warfare but Kaiser Wilhelm and Chancellor Theobald von Bethmann Hollweg were concerned about US opinion. The US government opposed the treatment of armed merchant ship as warships. Following a conference on 4 March the Kaiser accepted that unrestricted warfare was necessary, with a likely start date of 1 April. Until then, Bethmann Hollweg should attempt to persuade the Americans to accept the German view. In the interim U-boats were authorised to sink enemy merchant ships in the war zone and armed ones outside it. Passenger liners, whether armed or not, could not be attacked anywhere by submerged U-boats. Halpern describes this as ‘sharpened’ rather than unrestricted submarine warfare. Admiral Alfred von Tirpitz, the architect of the German battlefleet had not been invited to the 4 March meeting. He resigned as State Secretary of the Imperial Naval Office, a job mainly concerned with administration and naval building, soon afterwards. The Germans had 52 U-boats in March 1916, compared with 29 or 30 when they began unrestricted submarine warfare a year before. Of these 16 were in the North Sea, 20 small and short ranged ones with the Flanders Flotilla, 4 in the Baltic, 7 in the Adriatic and 5 at Istanbul. It was expected that another 38 would be completed by August. Several Dutch merchant ships were sunk in March, including the 13,911 liner Tubantia, the largest neutral ship sunk during the war. The Dutch were angered by these losses, but the attitude of the USA was far more important to the Germans. On the afternoon of 24 March the 1,353 ton French packet Sussex was torpedoed and badly damaged by UB29 (Oberleutnant Herbert Pustkuchen) whilst making her regular run from Folkestone to Dieppe with over 325 passengers. The Germans claimed at first that she had hit a mine, but fragments of a torpedo were found after she had been towed into Boulogne. The 50 dead included some of the 25 Americans on board. Pustkuchen claimed that he assumed from her crowded decks that she was a troopship. British troopships then crossed at night between Folkestone and Boulogne. The Germans may not have known that and Pustkuchen, with the very limited view offered by a periscope, may have genuinely thought that he was firing at a troopship. His action, however, created a major diplomatic incident with the USA. On 20 April the Germans agreed to stop sinking merchant ships without warning. Four days later Admiral Reinhard Scheer, the recently appointed C.-in-C. of the High Seas Fleet, recalled all his U-boats from the North Sea on the grounds that there was no point in sending boats on dangerous missions when their actions were so restricted. This left only the short ranged boats of the Flanders Flotilla operating against Allied shipping in British waters. The following table shows Allied shipping losses to U-boats since the end of the period of unrestricted submarine warfare. Sinkings rose in April and May and then fell again, especially outside the Mediterranean, to which several U-boats were transferred in September 1915 so that they could raid Allied commerce in an area where the risk of killing Americans was reduced, although not eliminated. On 7 November U38, a German boat that was flying Austro-Hungarian colours because Germany and Italy were not yet at war, sank the Italian liner Ancona, killing over 200 people, including about 20 Americans. Source: P. G. Halpern, A Naval History of World War I, (London: UCL Press, 1994), p. 308. The Germans thought that unrestricted submarine warfare was their best chance of forcing Britain out of the war. However, it also risked bringing the USA into the war on the Allied side. In 1916 they had too few U-boats to achieve the former but pursuing this strategy could still cause the latter. Naval Staff Monograph (Historical) 1926 vol. xv, Home Waters part vi, October 1915 to May 1916. p. 94. P. G. Halpern, A Naval History of World War I (London: UCL Press, 1994), p. 305. Naval Staff vol. Xv. p. 139. Quoted in R. H. Gibson, M. Prendergast, The German Submarine War, 1914-1918. (London: Constable, 1931), p. 88.